Camden Archambeau appeared on Show 363 on November 17, 2018 in Storrs, Connecticut. 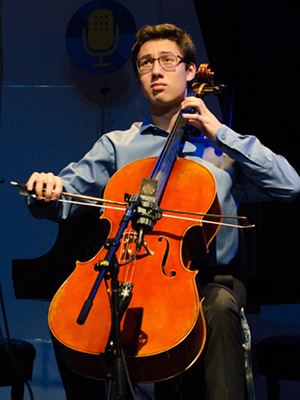 Camden Archambeau (cello), 17, is a senior at Weston High School in Weston, Connecticut. Camden and music are inseparable. He has been involved with orchestras and choral groups since the age of seven. Camden is Principal Cellist of the New York Youth Symphony, which performs regularly at venues including Symphony Space, United Palace, and Carnegie Hall. He served as Principal Cellist of orchestras including the National Arts Centre of Canada SMI YAP Pre-College Orchestra, Danbury Community Orchestra, LIU Post Summer Festival Orchestra, and Interlochen Jr. Advanced Strings Orchestra. As an orchestra soloist, Camden performed most recently with the Greater Bridgeport Symphony as winner of their 2018 Young Instrumentalists Competition. Camden is an avid chamber musician performing in the tri-state area and attending summer programs at the Meadowmount School of Music, National Arts Center of Canada, Interlochen, LIU Post, Music at Port Milford and Danbury Music Centre. He is a student of Sieun Lin and David Finckel in The Juilliard School’s Pre-College Division and previously studied with Adam Grabois at the Weston Music Center. Camden enjoys performing for and coaching young string players in community outreach programs through Music for Youth in Bridgeport Public Schools. He is an award winning writer and a Captain of the Weston HS Varsity Boys Swim Team. Camden also enjoys conducting, history and singing.